No major meteor showers are predicted until the Lyrid shower, peaking on the morning of April 23, 2015. Between now and then … fireball season! After the Quadrantid meteor shower in early January each year, we have a lull in meteor shower activity. No major showers are predicted between early January and the second half of April, when the Lyrid meteor shower will take place. Between now and then, we also have fireball season, which happens for a few weeks around the March equinox. Follow the links below to learn what to expect for meteor showers over the coming months. Around the March equinox … fireball season. Lyrid meteor shower peaks the morning of April 23, 2015. Fireball! Against the backdrop of the northern lights, no less. Captured March 6, 2014 by Yuichi Takasake in Canada. 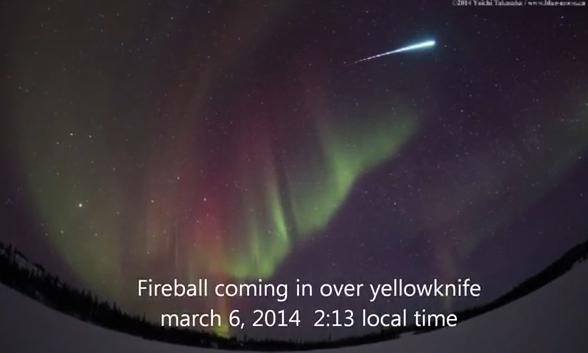 … evening fireballs seem to peak [around the March equinox] from the Northern Hemisphere. This could be due to the fact the antapex radiant [the point the solar system is moving away from, as we orbit the sun] lies highest above the horizon this time of year during the evening hours. The reason why is still unknown, but one hypothesis is that more space debris litters this section of Earth’s orbit. Meteors are debris from space. They typically range in size from a few feet (about a meter) to smaller than a grain of sand. As these objects enter Earth’s atmosphere, they vaporize due to friction with the air. That’s when you might see an ordinary meteor … or very bright fireball! The radiant point of the Lyrid meteor shower is near the bright star Vega in the constellation Lyra the Harp. The radiant rises in the northeast at about 10 p.m. on April evenings. Lyrid meteor shower peaks the morning of April 23, 2015. The Lyrids are one of the dozen or so major meteor showers predicted to occur every year. They happen when Earth in its orbit crosses the orbit of this or that comet. In the case of the Lyrids, the comet is Comet Thatcher (C/1861 G1). In 2015, the Lyrids will peak on the mornings of April 22 and 23, not the evenings, with the nod going to April 23 before dawn. The Lyrids’ peak tends to be short-lived, but, still, you might also see meteors before and after that date since we’re crossing the Lyrid meteor stream – that is, fording the meteoroid stream in space, composed of debris left behind by Comet Thatcher – from about April 16 to 25. The good news for April’s Lyrid meteor shower is that the moon will not interfere. A waxing crescent moon will set early on the evening of April 21, 2015, leaving a dark for watching this year’s Lyrid peak on the morning of April 23. 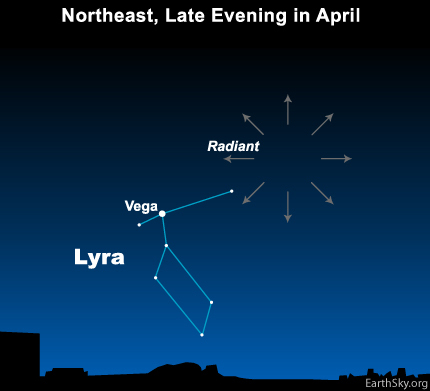 The radiant for this shower is near the bright star Vega in the constellation Lyra, which rises in the northeast at about 10 p.m. on April evenings. On the peak morning, expect to see 10-20 meteors per hour. 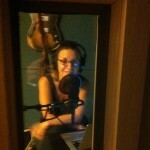 But you might see more. The Lyrids are known for uncommon surges that can sometimes bring the rate up to 100 per hour. Those rare outbursts are not easy to predict, but they’re one of the reasons the tantalizing Lyrids are worth checking out around their peak morning. One last note: Lyrid meteors tend to be bright and often leave trails. View larger. 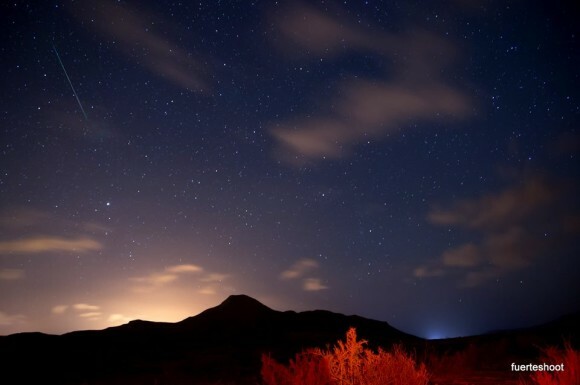 | Simon Waldram in the Canary Islands caught this Lyrid meteor on the night of April 20-21, 2014. Thank you, Simon! Bottom line: There’s always a lull in meteor shower activity between the Quadrantid shower in January and April. Next major meteor shower will be the Lyrids.